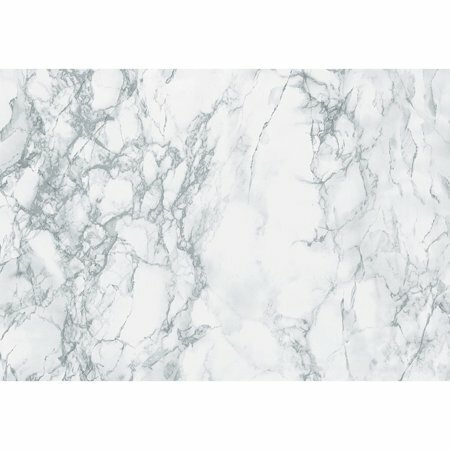 The DC Fix Grey Marble Adhesive Film allows you to decorate your kitchen or bathroom in a misty marble texture. This easy to use home decor accessory adds a shiny finish on plain flat surfaces. The vinyl film adhesive features a mixture of greys and whites that float beautifully together, bringing a wonderful updated aesthetic to your rooms. I used it on my MacBook and it's came out really nice!! I love this product! Can't wait to transform my coffee table next. I am so happy I went with this one. It is much prettier and glamours than the image gives it credit for. Def ordering another one and keep it for future use. I purchased this to redo the top of my mani desk and omg it's so fancy. Bought this to redo a chipped worn out laminate coffee table. The result is stunning! Can't attest for how well it holds up as just applied the night before. I had a cheap desk that the top was worn off of the fake wood. Not wanting to buy a new one this fit the bill. Is someone going to think my cheap desk is marble? No. Does it look pretty good? Yes! They have come a long way with patterns since the days of only using this as drawer paper. You are only limited by your imagination. I read where this was recommended as a photo backdrop for item placement, and it worked great! I used a foam board as the backing to give it stability, and I was so impressed with how it turned out. Very good quality, and it arrived faster than expected. I love this marble pattern. I covered my bath counter and it looks awesome! Easy to cover...just watch a few videos. This product is thicker than the contact paper found in stores. It is very forgiving when you need to lift it to reposition. I used it on my bathroom countertop and people are amazed thinking I actually have a marble countertop. I was so happy to find this product. Very easy to work with. My only complaint would be that it did not stick well to the underside of the particle board. I had to add tape. Overall look is nice! It looks pretty far away but it looks ugly close. Because you can see where it needs the little sticker for the tiny space.